Citation (APA Style): Boath, E., Stewart, A, & Carryer, A. (2013). Tapping for success: A pilot study to explore if Emotional Freedom Techniques (EFT) can reduce anxiety and enhance academic performance in university students. Innovative Practice in Higher Education, 1(3), 1-13. 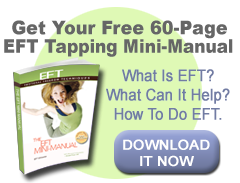 Emotional Freedom Techniques (EFT), also known as tapping, is an emerging psychological intervention that has been used to treat a variety of conditions, including exam stress and public speaking anxiety. Participants were a convenience sample of 52 3rd year Foundation Degree level students undertaking a Research Methods Module. The module included an assessed presentation, which was known to generate anxiety among students. The students were given a 15 minute assignment workshop. They then received a 15 minute lecture introducing EFT and were guided though one round of EFT focussing on their anxiety of public speaking. The students were assessed using the Subjective Units of Distress (SUDs) and the Hospital Anxiety and Depression Scale (HADS) pre and post EFT. The students were instructed that they could continue to use EFT at any time to reduce their anxiety regarding their assessed presentation. Immediately following their presentation, the students were invited to take part in a brief face- to-face interview to identify those who used EFT to explore their use of and feelings about EFT and to identify those who had chosen not to use EFT and explore their reasons for not choosing to use it. Forty Six of the total sample of 52 students (88%) participated in the research. There was a significant reduction in SUDS (p=p<0.001), HAD (p = 0.003) and HAD Anxiety Subscale (p<0.001). There was no difference in the HAD Depression Subscale (p=0.67). The qualitative data were analysed using a framework approach which revealed the following three themes: helpfulness of EFT in reducing anxiety and staying calm and focussed; Using other complementary therapy skills; and their reasons for not using EFT.